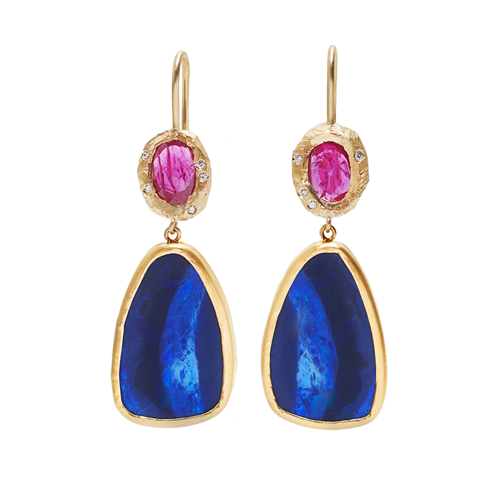 Gemstones that work with the fall fashion palette. According to color authority Pantone, beyond the color of the year, Greenery (think peridot), the top hues for fall will be all about down-to-business power dressing. Look for grenadine, tawny port and other rich reds (ruby, garnet, spinel), navy (sapphire, lappis), amber (rich citrines), warm neutrals (gold, brown diamonds, smoky topaz), cool neutrals (silver, grey diamonds, moonstones) and light pink—yes, for fall—(pink diamonds, morganite, rose quartz). Also look for multi trends—jewelry that combines interesting fall fashion color combos in one cool piece, like this triple moonstone and diamond ring from Aaron Henry Designs. and the Page Sargisson earrings shown above. Popular red carpet looks: Celebrities swanning the Red Carpet at the big award shows often trigger interest in the jewelry they wear. Still going strong are big collar necklaces, shoulder duster earrings, and cuff bracelets, especially those with an openness to them which have a lighter feel. 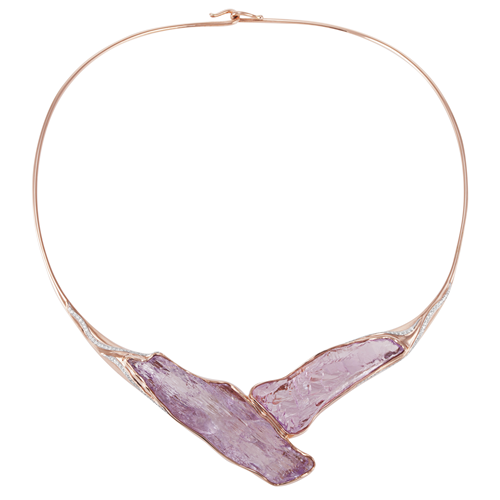 Shown Jorge Adeler’s kunzite and diamond hinged choker. New generation pearls. Pearls are back in a big way—but with a fresh new twist on classic strands and bracelets. The look is still polished enough for work and playful enough for off-duty down time. 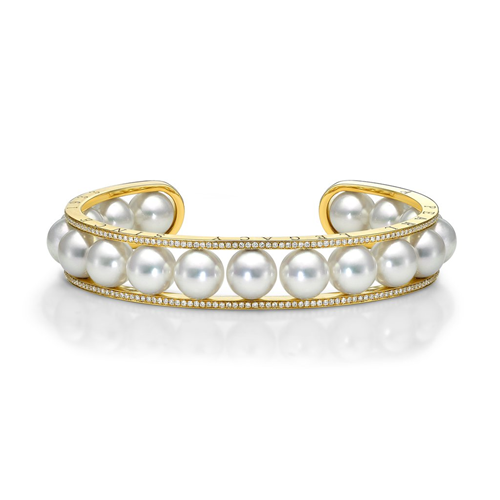 Shown: Belpearl USA Akoya pearl and diamond bangle. Shining wedding trends. Oval and Marquis settings are extremely popular. With marquis, wider bands and the newer east-west mounting are winning over younger brides looking for something different. Halos still shine as a coveted design detail and more brides are forgoing a traditional engagement ring in favor of stackable rings that can be added on to over the years. 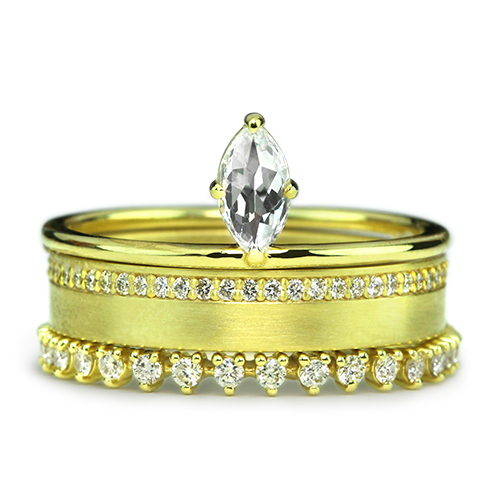 Shown: ILA Fine Jewelry ring stack in recycled gold and diamonds. 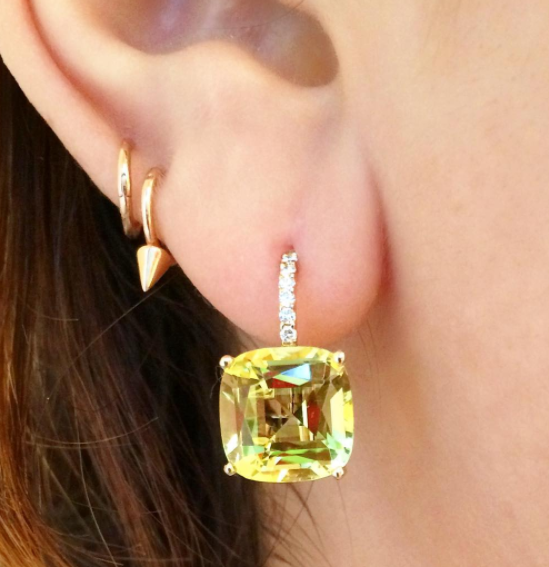 Lemon quartz and diamond earrings shown at top by Jane Taylor. whoah this blog is magnificent i love studying your posts. Stay up the great work! You understand, lots of individuals are hunting round for this info, you can aid them greatly. sure; glad you like it!